The Fjallraven Barents Pro Trousers are a superb pair of durable and versatile outdoor trousers from Fjallraven's 'Classical Trekking' range. They feature reinforced panels across the rear and knees, a variety of pockets, and 'raw-length' legs, meaning that they can be cut and adjusted to your exact requirements. 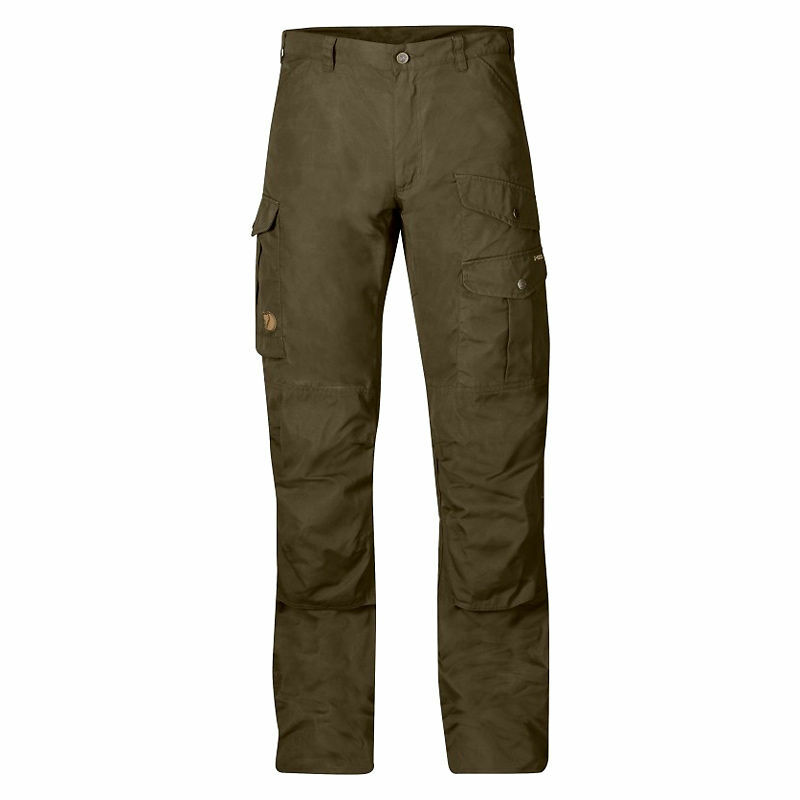 The Barents Pro Trousers are made from Fjällraven's classic G-1000 material. This densely woven fabric is a blend of 65% polyester and 35% cotton, making the material windproof and outstandingly hardwearing. 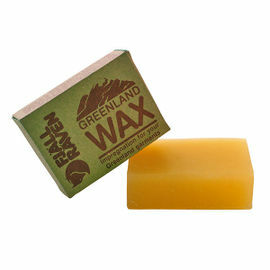 It is also water-resistant thanks to an impregnation of Greenland Wax, which can be reapplied when necessary throughout the life of the product. 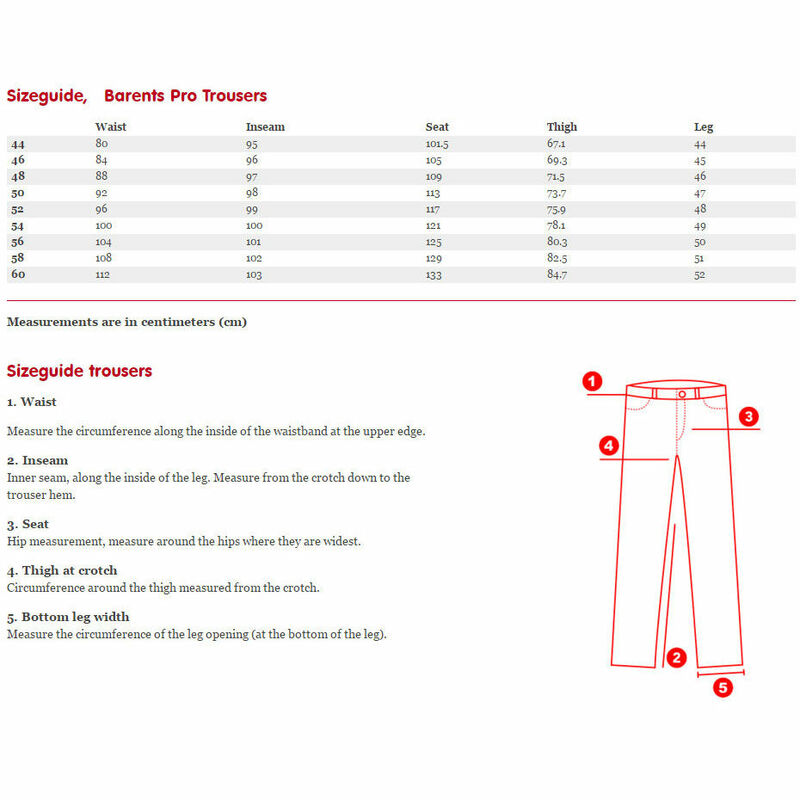 This high-strength fabric also wicks moisture away from the body, making the Barents Pro Trousers ideal for active use in the outdoors all year round. 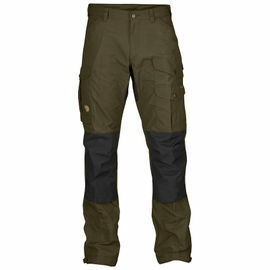 Fjallraven Barents Pro Trousers - Dark Olive is rated 5/5 based on 73 customer reviews. Arrived promptly. From the options available I chose the size smaller than my usual size which I found to be quite comfortable. The trousers are well made with various pocket types for tools and personal stuff. Super-strong, very comfortable feel, great fit and comfortable to wear. Certainly as windproof as claimed, and has made walking along the north Kent shoreline a pleasure in the biting northerlies coming across the estuary. Thanks Woodlore Team. Excellent trousers. I decided last minute to buy them just before I went to Canada and they have been great, fit well and are very comfortable I will definitely be buying more and again due to the speed of delivery. As usual, fantastic service from Woodlore. Arrives within two days (often next day) these are the best trousers I’ve owned. I have four pairs now, I usually go a size down for better fitting in normal weather and my usual size gives enough room in winter to get thermals underneath. These are simply the best trouser I have ever worn. Comfortable with plenty of pockets for storage, hardwearing & durable for trekking & camp days. Pricey yeah but the craftsmanship is second to none, they’re made to last. These trousers are seemingly bullet proof and quite honestly amazing. I did however have to have them taken up due to my short legs. A warning for you, in normal weather, these trousers are unsuitable and they are very warm. Expensive yes - worth it YES. Excellent service - very quick delivery - excellent quality trousers - very happy. This is my second pair of Barents Pro trousers. I still wear my old pair almost every weekend for hiking, dog walking, fishing and camping when I get the chance. Absolutely the best pair of general use outdoor trousers I have ever worn. 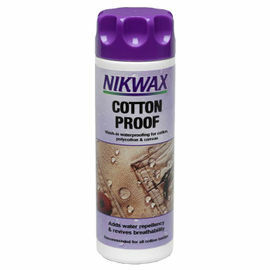 Comfortable, breathable and you can wax them up if it’s going to be really wet. They are extremely tough and the pockets are well designed. I wanted a second pair just in case one pair is in the wash! Outstanding. Best trousers I've ever owned. Such a good investment. They're incredibly well designed and made. I use these as casual trousers as well as hiking and working trousers. I'm amazed at how together they still look and feel. Waxing them up is a nice thing to do, like collecting firewood, its therapeutic and rewarding, and once waxed and its wet these are a joy to wear. The pockets are neatly discreet thanks to the dark olive colour. I can fit my lunch, snacks, tools and other gear around the pockets with ease. Great to store cash or cards etc when out and about, the pockets lock together well. The shape of the trouser follows the gentle curve in your legs, which makes them a real joy to wear, a simple but very effective device. Along with a few other items, these trousers are an essential piece of kit. I know that when I head out these will perform and never let me down. Incredible piece of clothing and one that makes you want to wear them and get outside.